I finally read a Neil Gaiman novel! It has taken me awhile to read Gaiman as a novelist, even though I read the groundbreaking and wonderful Sandman comic book series back in the 1990s. Gaiman is an author I have been meaning to read over the years and the time came to do it. 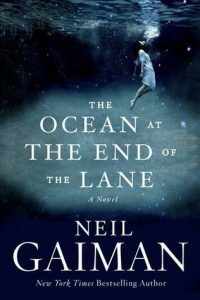 The Ocean at the End of Lane tells the story of a middle-aged unnamed protagonist who returns to his childhood home to examine what happened when he was seven years old and how that event that has affected him for the rest of his life. The story written as a fairytale and has engaging characters like Lettie Hempstock, the best friend of the unnamed protagonist as a boy, Grannie Hempstock, the wise seer of the Hempstock family, and Ursula Monkton, the antagonist, who came across as scary. I read this book in two settings (it’s only 180 pages). Gaiman is an excellent storyteller and it kept me interested throughout the entire novel. I will admit that I like this book more than I love it. Reading is subjective and some books connected you more emotionally than others. The Ocean At The End of The Lane did not have that deep connection for me. But, I believe it’s an excellent book to start for those who have not read Neil Gaiman. I’m glad I have finally read a Gaiman novel and I can cross this one off my reading bucket list.